It's the 5th and it's Caardvarks time...And we have another fantastic Sponsor on board to sponsor our team and challenge! SRM STICKERS!!! Have you added stickers to your cards lately??? Well, I have here to report to you, how FUN and EASY working with the SRM Stickers is, when you have the right sticker to work with.. Let me share the two cards I made with them. 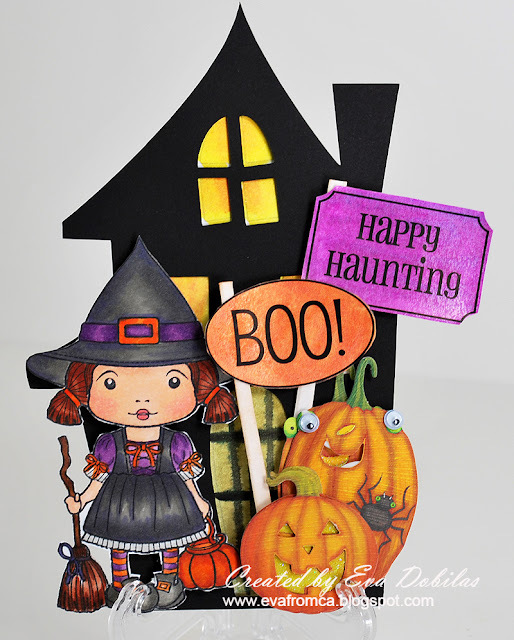 First off is another little house card, which was cut with my Silhouette and added sweet Witch Marci to it, which I colored with Copic, but look what I did with the stickers? I made little flags with them. How??? Well, I just took a white cardstock, painted a large enough section of it with the Twinkling H2O colors I wanted to make my flag with and once it dried, which was just a few minutes, I laid my stickers on it and cut it out and added it to my flag pole with my Helmar 450 liquid glue. And here is what it looks like. And here is my second card, which is again with Marci and this time I made it a Thank you card. I really love the font on these sentiments so sweet, matching sweet Marci. The papers I used on this card is by October Afternoon, their Seaside papers. So no, if you didn't come here from Caardvarks already, head on over there to check out what the other designers came up with and this time our challenge is to LIFT A CARD FROM THE DT. So let's see those cards you lifted for a chance to win these fun stickers!!!! I can't wait!